If you're planning a vacation to the Central Florida area, the I-Ride Trolley is a must-do for your visit. It's easy. Saves time. Affordable. Stress-free. And it delivers you right to where you want to go! Combining the charm of the past with today’s modern comforts and latest technology, the Trolleys provide a convenient way to transport visitors to the attractions, shopping and accommodations. At $2.00 for a single adult ride, it is the best bargain to be found on an Orlando vacation and visitors enjoy parking the car and leaving the driving to the Trolley conductors. The Trolley makes navigating the I-Drive area a breeze with its state-of-the-art transportation system. The fleet of trolleys is equipped with a vehicle location system (AVLS) known as NextBus. Branded as “NextTrolley,” visitors obtain predicted Trolley arrival times and live maps. This information is available at www.IRideTrolley.com, mobile devices at iDrive2Go.mobi or by simply SMS texting the Trolley stop code which is found at each Trolley stop. With iDrive2Go.mobi, guests find loads of options for dining, shopping or attractions on I-Drive. The I-Ride Trolley section provides “NextTrolley” information as well as maps and listings of what is near each trolley stop. Access to the mobile site is obtained by QR scanning, SMS texting or by simply going to iDrive2Go.mobi on a smart phone. For travelers looking for ways to stretch their budgets, the Trolley is more than a way to get from point to point. It saves money on gas. It also gives visitors a chance to relax and leave the driving to the conductor. Fare: Single cash fare, $2.00 per ride; child cash fare, $1.00 per ride (ages 3 to 9 with paying adult); senior fare 65 and over, $0.25 per ride. Unlimited ride passes are available: one-day pass, $5.00 per person; three-day pass, $7.00 per person; five-day pass, $9.00 per person; seven-day pass, $12.00 per person; 14-day pass, $18.00 per person. Unlimited ride passes are sold at more than 100 locations within the resort area or online here. Route information - Red line: this 15-mile (each way) route services the north and southbound I-Drive Area with 71 stops. Green line:This 12-mile (each way) route travels along Universal Blvd. offering the counterpart service to the Red line with 50 stops. Capacity: Each I-Ride Trolley seats 41 riders and includes two wheelchair positions and an ADA-specified hydraulic lift system. Markers/Shelters:The system’s 100 markers make I-Drive easy to navigate by car, walking or using the Trolley. The 10-foot high markers are located on both sides of the road for each stop. Trolley stop shelters offer solar lighting as well as seating, maps and location information. Security: The Trolley equipment includes security cameras on each vehicle, automatic passenger counters, automated stop announcement system, LED destination signage and LED exterior accent lighting visible day and night. Riding green: The I-Ride Trolley’s also have a “green” component. In keeping with the eco-friendliness of I-Drive, the new trolleys are equipped with Clean Diesel Technology (CDT) engines from Cummins, a technology leader in the diesel engine market. The CDT engines eliminate 90 percent of the particulate matter (exhaust pipe smoke) and over 90 percent more of the mono-nitrogen oxides (smog). The new engines are also 10 percent more fuel efficient which helps reduce green house gas (GHG) emissions. 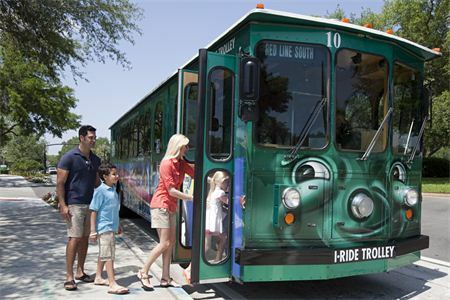 The I-Ride Trolley service is owned by the International Drive Transit & Improvement District and is operated under contract by the Mears Transportation Group in Orlando, FL.